Anna Vaughn Hyatt’s marriage to the exceptionally wealthy Archer Milton Huntington was the catalyst for tremendous changes in her personal and professional life. It affected her sculptural work, affording the opportunity to develop international, competitive ambitions and presaged the course of her later career. Her husband’s substantial fortune was passed down to him by his father, a railroad magnate. The young Huntington eschewed the opportunity to take up the family business, embarking instead on a life of study and philanthropy. His unyielding scholarly passion was Spain, and in 1904 he founded the Hispanic Society of America at Broadway and 155th Street. It was in his role as director of that institution that he and Vaughn Hyatt first corresponded in 1921, about the commissioning of a medal.2 In late summer of the same year, they began to plan out a grouping of sculptures for the Hispanic Society’s courtyard; however, those plans were put on hold for a time.3 Soon after they married though, the planned courtyard sculpture began to take shape. In a letter to her mother in late 1923 Hyatt Huntington declared, referring to a potential commission in Colorado Springs, that “I am quite satisfied that it is put off as I would much rather start as soon as possible on the Huntington prospect, it holding out infinately [sic] more interesting work.”4 She was plainly animated by the chance to work on a new, multi-faceted project instead of on commissioned statues more in line with her past production. Her marriage not only affected her new undertakings, it also extended the life of her older works. No longer did she have to worry about finances or the cost of casting; many of her early works were cast in bronze, and in larger sizes, and the majority of her new works of the mid-1920s were on a grander scale. Huntington himself, with his portfolio of museum contacts, as well as his own network of artistic and cultural institutions all across the United States, was an avid supporter. Museums large and small across the country hold her work, often because she and Huntington presented it to them free of charge. She knew how important it was for her sculpture that her spouse took such an enthusiastic interest in her art: “am I not a lucky dog to have a husband that wants to see my work put up in fine places?” she remarked to her mother, in a private expression of her gratitude.5 However, Huntington was not simply a munificent benefactor, he was also a constant and loved companion, and his passion for Spain mixed with her sculpture—as it had in their early, almost courtship-like, discussions of the courtyard—to produce the Spanish themes and subjects that defined her output in the middle to late 1920s. 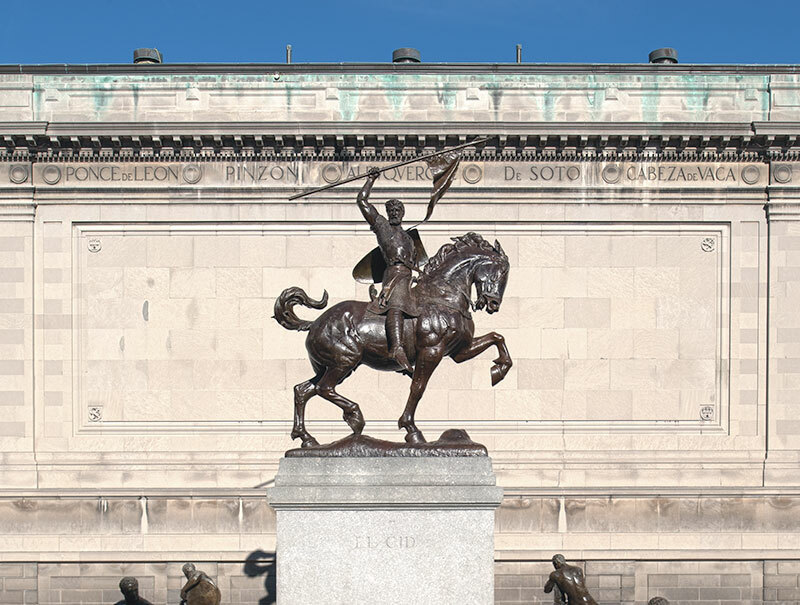 Chief among the works for the courtyard of the Hispanic Society was El Cid Campeador. Hyatt Huntington’s grand courtyard centerpiece was the result of a long process of study, modeling, and revision. Work began in summer 1924, after the couple returned from a months-long Caribbean cruise on their yacht.6 Freed from her other artistic obligations, she was thrilled to again sculpt something truly large in scale.7 During the time spent working on El Cid, she accepted no other commissions, and kept the project (whose final form seems to have been finalized by early 1925) a secret.8 Her sculpture of El Cid was a clear reflection of Huntington’s lifelong obsession with Spain, and was linked to his standout scholarly achievement: the 1907 publication of his translation of the Cantar del Mio Cid. The plan for the courtyard seems to have been a collaborative effort from start to finish—though this is only intimated in the extant correspondence. The courtyard itself, however, offers telling evidence of a joint project. The back of the pedestal bears an inscribed sonnet by Huntington, and he composed short verses which, cut into stone, caption the later reliefs of Don Quixote and Boabdil (the last Islamic ruler of Granada), and decorate a panel of the courtyard’s west wall. When El Cid was first shown to the public in New York, in the fall of 1927, conservative critic Royal Cortissoz lauded her depiction of the “queller of the Moors,” praising its evocation of the legendary warrior’s essence, and singling out for plaudits its “truly unified design” and “unfaltering energy.” 9 This New York version was not, however, the first casting of the piece. As Hyatt Huntington put the finishing touches on El Cid in early 1926, her husband, who had made high-ranking contacts in Spain through his longstanding mission to acquire books, manuscripts, and art for the Hispanic Society, wrote to a good friend of his in Madrid, the Marqués de la Vega-Inclán, then the king’s commissioner of tourism for the country. In his letter, Huntington expressed a desire to have his wife’s Cid Campeador erected in the Burgos area (the city of the hero’s birth) or, failing that, in another fitting location. He then asked his friend to bring the matter (and the enclosed photographs) to the king’s attention, for it was, he declared, “a plan which is very near my heart.”10 King Alfonso XIII must have looked favorably on the tribute to El Cid by the Huntingtons; the first cast was given to Spain, but instead of standing in Burgos, it was sent to Seville, where it would be a visual focal point of the 1929 Ibero-American Exposition. But her diplomatic duties had hardly begun. In the spring of 1929 she and her husband travelled to Spain for a month-long trip, during which they spent the majority of their time in Madrid and Seville. The trip was a whirlwind of meet and greets, often with scholarly or aristocratic acquaintances of Huntington, as well as a chance for Hyatt Huntington to see something of the country her husband cared so deeply for. They attended a bullfight in Seville with the American ambassador (who was visiting southern Spain for the Ibero-American Exposition, which opened in May), visited the birthplace of El Cid outside Burgos, and were treated to a private, after-hours tour of the Prado by the head curator.16 Besides seeing the sights, though, they had meetings at the very highest levels of Spanish government, with both the royal family and the head of the government, Primo de Rivera. Their meeting with Rivera was short, but he “said very nice things about [her] Cid,” probably at least partly in an effort to secure the Huntingtons’ support in dealings with the United States.17 The royal family also expressed their admiration for the sculpture. She and Huntington lunched with them alone on April 12, 1929, an encounter she detailed at length in a letter home to her mother. King Alfonso was “very quick and direct and spoke so well of my Cid, he is the first person to see that the work was done purely from imagination, as he put it, ‘you have done the sort of horse that should have been used at that time and for which you could have had no model as there was practically no data from which to work,’ and he seemed equally pleased with the personality of the Cid.”18 The king later mentioned to Hyatt Huntington that he “did not mean your husband should leave Europe without coming to see [him],”19 reaffirming the pivotal role the Spanish government had envisioned for Huntington in building strong cultural ties with the United States. Hyatt Huntington took up her new role as diplomat with aplomb throughout her trip to Spain: she attended dinners at the American embassy, visited the young Prince Alfonso at the Pardo Palace outside Madrid, and observed a ceremony inducting the Duke of Alba into the order of the Knights of Santiago.20 This hobnobbing was not without purpose. As a representative of the United States, an esteemed sculptor in her own right, daughter of a respected professor, and spouse of an influential American millionaire, Hyatt Huntington served as a conduit between the high societies of the United States and Spain. She was not alone however. Gertrude Vanderbilt Whitney, a member of a New York elite circle similar to Hyatt Huntington’s, had also sculpted a grand monument for Spain. Whitney was a scion of both the Vanderbilt and Whitney families, and enormously wealthy; she was also a serious sculptor21. Briefly a pupil of Rodin, and recognized with France’s Legion of Honor for her sculptural work in 1926 (as Hyatt Huntington had been in 1922), she was in many ways an exact peer to Hyatt Huntington, and a rival. Her El Cid was well-liked in all of its locations. The first two casts were installed in 1927, in New York and Seville. Shortly thereafter, casts were sent to San Francisco, Buenos Aires, and San Diego. In San Francisco, the Cid Campeador was installed as part of a broader exhibition of American sculpture in 1929. After the exhibition it was put into storage until 1937, when a patron donated funds for the pedestal on which it still stands at the Legion of Honor, facing a version of her Joan of Arc. The city of Buenos Aires acquired their Cid in 1930, and it was set on its pedestal near the center of the city and unveiled on October 12, 1935.36 The San Diego version looks out over Balboa Park, where it was inaugurated on July 5, 1930.37 All of these castings were financed by the Hispanic Society, an early expression of a broader enterprise that saw the Huntingtons donate her works to museums throughout the United States. But even in this early period, she enthused, “A is determined to dot my work all over.”38 In addition to a half-size reduction of the work on display at Brookgreen Gardens—the sculpture park in South Carolina that the Huntingtons founded together—a final full-scale version was executed in 1964. With the blessing of Hyatt Huntington, the Spanish sculptor Juan de Ávalos made a cast based directly on her sculpture in Seville that was destined for Valencia, the city that El Cid conquered and ruled from. The statue was the final holdover from the crucial moment in the mid-1920s when her marriage encouraged her to adapt herself to a new, more prominent public role as Huntington’s wife, yet also as an eminent, in-demand sculptor. Hyatt Huntington’s professional trajectory was affected by her marriage, but so was her personal life. Ever an independent, self-sufficient character, the rigors of the dauntingly full social schedule required of a woman of her class in the 1920s and 1930s must have been a burden at first. Her correspondence records endless, quite formal lunches, dinners, teas, and excursions to the opera. Certainly, she enjoyed great luxury in her and Huntington’s mansion at 1 East 89th Street (they donated the building to the National Academy of Design, based there today), but her comfortable life came with many responsibilities. As Huntington’s wife, she was courted by museums and other institutions, seeking their combined philanthropic interest. Her diplomatic role was also notable: the couple often entertained the Spanish ambassador and were called upon by many distinguished Spanish nobles and dignitaries. In addition, various long-term organizational projects kept her from her sculptural work, including the cleaning out of artworks and antique furniture from a from her mother-in-law Arabella Huntington’s mansion in New York. Even when she fell seriously ill with tuberculosis, in 1927, she continued to work on her sculpture when she could and always attempted to be closely in touch with the goings-on of the sculptural community, and particularly the other women sculptors in her circle. Given the financial resources to help her professional circle, Hyatt Huntington acted magnanimously and decisively in her new role as patron. Her long-time friend, fellow sculptor, and one of the many recipients of her financial help,41 Brenda Putnam, wrote to her in 1933, asking what it felt like “to be able to save the lives, the morals, the very souls of people who are worth while?”42 Although she continued to develop her own sculptural projects until the end of her life, the charitable giving and concern for sculptors in the United States that she began to act on in the late 1920s formed a complementary coda to her later artistic career. The identity Hyatt Huntington modeled for herself during these years endured throughout the rest of her long life. As a philanthropist, she was generous, and as a sculptor, she continued to hope to link the United States, and New York in particular, to other nations through her art. The last of her heroic male equestrians, of which El Cid Campeador was the first, was completed in 1959 when she was 82. She donated her monument to José Martí—the Cuban nationalist who fought to free the island from Spanish rule—to New York on behalf of the people of Cuba. It stands today on the southern edge of Central Park, a final testament to the grand ambition of the sculptor and patron that she became in the late 1920s. 1 Archer Milton Huntington to Arabella Huntington, March 10, 1923. Anna Hyatt Huntington Papers, Syracuse University, Box 37. 2 Vaughn Hyatt executed a medal at Huntington’s request for the American Academy of Arts and Letters, which took up residence near the Hispanic Society at Audubon Terrace in 1923. The commissioned medal, called the William Dean Howells Medal of the American Academy of Arts and Letters honors the first president of the Academy. First struck in 1923, it continues to be awarded once every five years in recognition of the most distinguished American novel published during the five-year period. 3 BackAnna Vaughn Hyatt to Archer Milton Huntington, September 11, 1921. Anna Hyatt Huntington Papers, Syracuse University, Box 37; Archer Milton Huntington to Anna Vaughn Hyatt, November 3, 1921. Anna Hyatt Huntington Papers, Syracuse University, Box 35. 4 Anna Hyatt Huntington to Audella Beebe Hyatt, December 18, 1923. The Hispanic Society of America archives. 5 Anna Hyatt Huntington to Audella Beebe Hyatt, August 19, 1927. The Hispanic Society of America archives. 6 The trip is described in detail in her correspondence. Anna Hyatt Huntington to Audella Beebe Hyatt, February–May, 1924. Hispanic Society of America archives. 7 Anna Hyatt Huntington to Audella Beebe Hyatt, June 22, 1924. Hispanic Society of America archives. 8 Anna Hyatt Huntington to Audella Beebe Hyatt, March 20, 1925; Anna Hyatt Huntington to Audella Beebe Hyatt, mid-April, 1925. Hispanic Society of America archives. 9 Royal Cortissoz, “Chinese Paintings in Our Collections,” New York Herald Tribune, October 9, 1927. 10 Archer Milton Huntington to the Marqués de la Vega-Inclán, June 13, 1926. Courtyard Sculpture Binder, Hispanic Society of America archives. 11 This position and its variants are reviewed in Richard L. Kagan, “Prescott’s Paradigm: American Historical Scholarship and the Decline of Spain,” The American Historical Review 101, no. 2 (1996): 423–446. 12 The exposition in Seville, together with the 1929 Universal Exposition then being held in Barcelona, constituted a single world’s fair. European nations had their delegations in Barcelona (Ludwig Mies van der Rohe designed Germany’s now well-known pavilion); the United States and Latin American countries were based in Seville. 13 I am grateful to José Léon Calzado, an art historian based in Seville, for permitting me to cite his work and for corresponding with me about the sculpture. He researched it as part of a 2012 restoration process that was conducted as part of the municipal government’s campaign to conserve the city’s public monuments. His research indicates that El Cid may have stood at a different location in Seville in 1927, when it first arrived. However, by the winter of 1928 it had been moved to its current location. 14 José Léon Calzado, “El Monumento,” El Cid de Sevilla, accessed November 24, 2013, http://www.metisrestaura.com/elciddesevilla/monumento/. 15 Ibid. Huntington paid for the building of the pedestal and the other installation costs. 16 Anna Hyatt Huntington to Audella Beebe Hyatt, April 2, 1929; April 21, 1929; April 10, 1929. Hispanic Society of America archives. 17 Anna Hyatt Huntington to Audella Beebe Hyatt, April 10, 1929. Hispanic Society of America archives. 18 BackAnna Hyatt Huntington to Audella Beebe Hyatt, April 12, 1929. Hispanic Society of America archives. 20 Anna Hyatt Huntington to Audella Beebe Hyatt, April 12, 1929; April 14, 1929; April 16, 1929. Hispanic Society of America archives. 21 For a brief account of her life and work see Janis Conner and Joel Rosenkranz, “Gertrude Vanderbilt Whitney,” in Rediscoveries in American Sculpture: Studio Works, 1893–1939 (Austin: University of Texas Press, 1989), 169–176. It is notable that Whitney had, like Hyatt Huntington, previously sculpted a monumental bronze equestrian, her 1924 piece The Scout, commemorating Buffalo Bill in Cody, Wyoming. 22“Navy Assigns Cruiser for Fete in Spain,” New York Times, March 6, 1929. 23 “Inauguración solemne del monumento erigido, en Huelva, a Cristóbal Colón,” ABC, April 23, 1929, morning edition. The newspaper article presents the full transcripts of Hammond and Rivera’s speeches. 24 Ibid. Unless otherwise noted, all translations are my own. 25 In addition to Hyatt Huntington and Whitney’s monuments, another American sculptor’s large work was unveiled in Spain around the same time. Charles C. Rumsey, who died in 1922, had an enlargement of his equestrian bronze of Francisco Pizarro, the Spanish conquistador, erected in Trujillo, Spain in the late 1920s. Hyatt Huntington had seen a smaller model for it in New York in 1925. Anna Hyatt Huntington to Audella Beebe Hyatt, February 24, 1925. She visited it while in Spain in 1929, and her critique was scathing: “it really is the worst equestrian that has ever been put up, even the small children wrinkle their noses at it in disgust, it has spoiled a beautiful old square—a big green distorted blot on a modern pedestal.” Anna Hyatt Huntington to Audella Beebe Hyatt, April 8, 1929. Hispanic Society of America archives. 26 Anna Hyatt Huntington to Audella Beebe Hyatt, April 12, 1929. Hispanic Society of America archives. 27 Anna Hyatt Huntington to Audella Beebe Hyatt, April 18, 1929. Hispanic Society of America archives. 28 Anna Hyatt Huntington to Audella Beebe Hyatt, April 18, 1929. Hispanic Society of America archives. 29 “Spain Honors Mrs. Whitney,” New York Times, June 21, 1930. 30 Anna Hyatt Huntington to Audella Beebe Hyatt, July 13, 1930. Hispanic Society of America archives. 33 It is possible that the bust was disposed of or destroyed during Francisco Franco’s dictatorship. Ramón Franco’s liberal politics clashed with his brother’s, and almost no mention was made of his accomplishments during the Franco years. He died in a mysterious plane crash in 1938. 34 Anna Hyatt Huntington to Audella Beebe Hyatt, July 13, 1930. Hispanic Society of America archives. 35 William H. Elsner to the Hispanic Society of America, November 8, 1968. Courtyard Sculpture Binder, Hispanic Society of America archives. Elsner, the curator of museum services at the Legion of Honor, looked throughtheir archives to sort out a question of when the sculpture was installed at its current location in San Francisco. 36Courtyard Sculpture Binder, Hispanic Society of America archives; “Entregase hoy a la ciudad el monumento del Cid Campeador,” El Mundo, October 13, 1935. 37Courtyard Sculpture Binder, Hispanic Society of America archives. 38 Anna Hyatt Huntington to Audella Beebe Hyatt, May 11, 1929. Hispanic Society of America archives. 39 Anna Hyatt Huntington to Audella Beebe Hyatt, April 26, 1928. Hispanic Society of America archives. She mentions the purchase of an animal sculpture from her friend Katherine Lane. 40Anna Hyatt Huntington to Harriet Randolph Hyatt, January 8, 1933. Hispanic Society of America archives. The jewellery she mentions had likely been Arabella Huntington’s, and passed on to her as a wedding present by Huntington. 42Brenda Putnam to Anna Hyatt Huntington, May 23, 1933. Anna Hyatt Huntington Papers, Syracuse University, Box 51. Anna Hyatt Huntington. El Cid Campeador, 1927. Bronze; 199 5/8 x 122 9/16 x 55 3/16 in. | 507 x 311.3 x 140.2 cm. Collection of the Ayuntamiento de Sevilla, Seville. Photo © ICAS-SAHP, Fototeca Municipal de Sevilla. This image shows the scaffolding that sculptor Juan de Ávalos used in 1964 to create the copy destined for Valencia. Gertrude Vanderbilt Whitney. Monumento a fe descubridora, 1929. Granite; height approx. 121 ft. | 37 m. Collection of the Ayuntamiento de Huelva, Huelva. Photo courtesy Juan María Moreno Urbano.